The pointy-hats have long ceased to shock me. 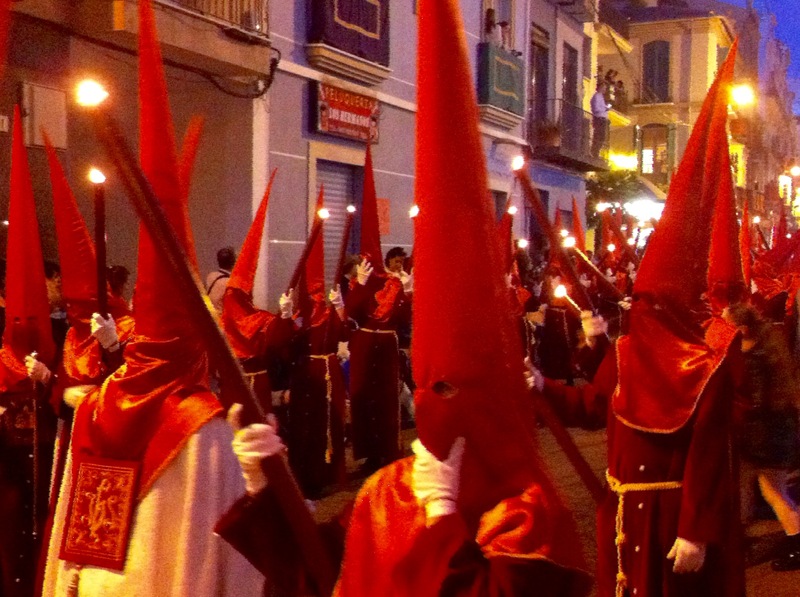 Once you realise that the Ku Klux Klan have NOT taken over Spain, the traditional costumes of the Nazarenos who lead and follow each cofradía (brotherhood) in the Semana Santa processions no longer provoke that inevitable first shocked reaction, and you can relax and enjoy the madness that takes over every city, town and village in Spain during Easter. 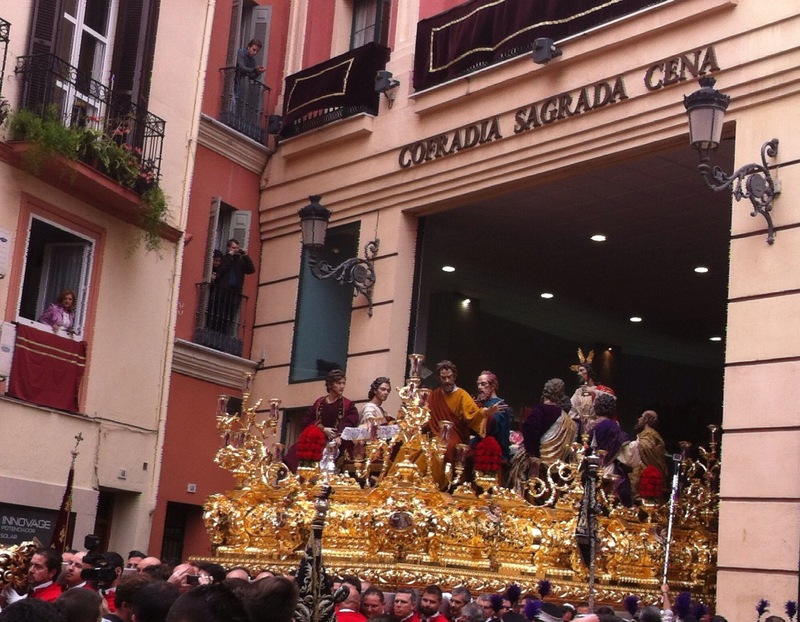 And every year you can dive into the packed streets of Málaga, find a vantage point, chat to other onlookers, let children squeeze through to the front, and then regret it while they jump on your toes and climb on the railing to block your view. 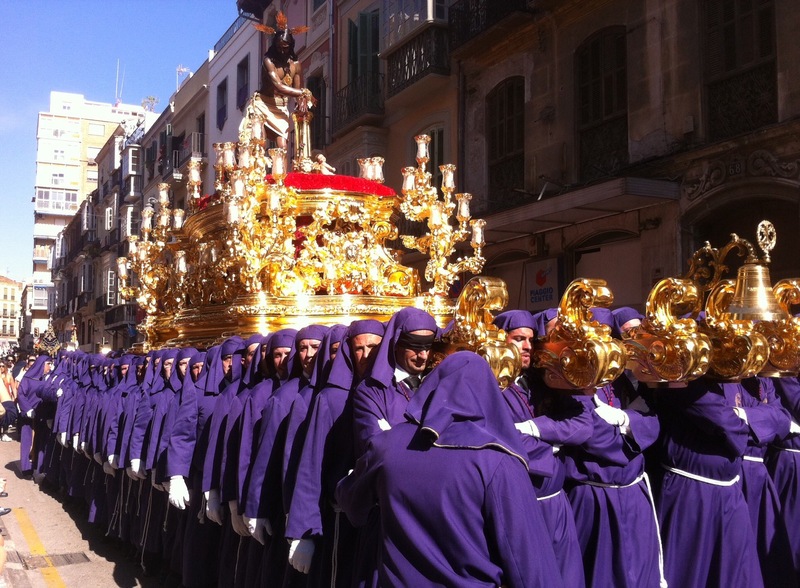 With 49 cofradías in Málaga city, each with between 1 and 4 tronos (thrones, or floats), each one carried by anything between 100 and 340 “hombres de tronos”, with a couple of hundred Nazarenos (the pointy-hat brigade) accompanying each trono, one or two bands, a collection of assorted Very Important People in cloaks with grand chains or badges or gold-topped sticks, a gaggle of children in training, learning to manage their cloaks, head-dresses and candles (for middle-sized children) or baskets (for the tiniest), and then the penitentes bringing up the rear (usually carrying short candles, dressed normally though some walk barefoot or blindfolded to more fully experience the pain and suffering of Christ), the total number of active participants during Semana Santa in Málaga is enormous. No fewer than 85 tronos make their way round the various routes, and if we conservatively assume an average of 400 people processing with each one, you have 34,000 people marching through the streets, plus the battalion of the Spanish Legion who disembark from a military ship singing their strange emotional song of being “the boyfriend of the good death”. Assuming that the extended family and assorted neighbours of each participant dutifully show up to demonstrate support for their mostly unrecognisable friend or relative (let us assume about eight per participant), it is easy to see why the streets are packed and the bars have their best week of the year. 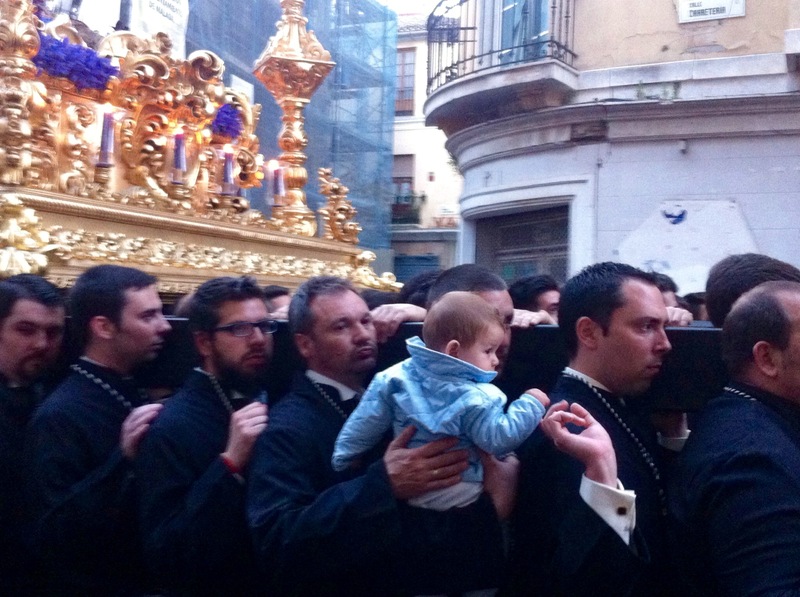 So Semana Santa is great for the city’s economy. It’s lousy for people trying to get to work – a young fellow-student in my class at La Escuela Oficial de Idiomas had managed to remain entirely unaware of the impending chaos and tried to drive to her work at a city-centre restaurant. She took an hour and a half to find somewhere to park. 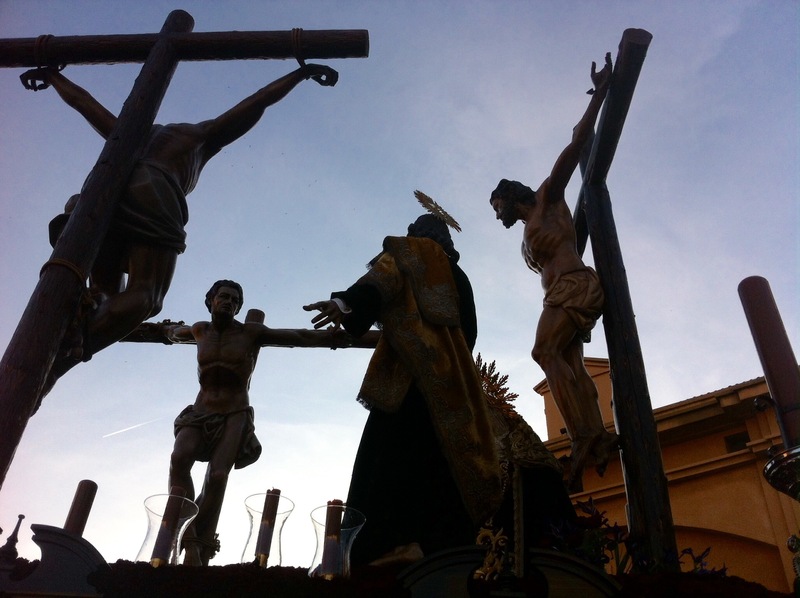 It’s an astonishing spectacle, and you don’t need to be religious to enjoy it or to marvel at it. It’s theatre, it’s culture, it’s community, it’s tourism, it’s fancy dress, it’s music, it’s art, it’s tradition, it’s fiesta and yes, there’s a bit of religion chucked in there in the statues of Christ and the Virgin, and in the adulation heaped upon them by (some of) the participants and (some of) the crowds. 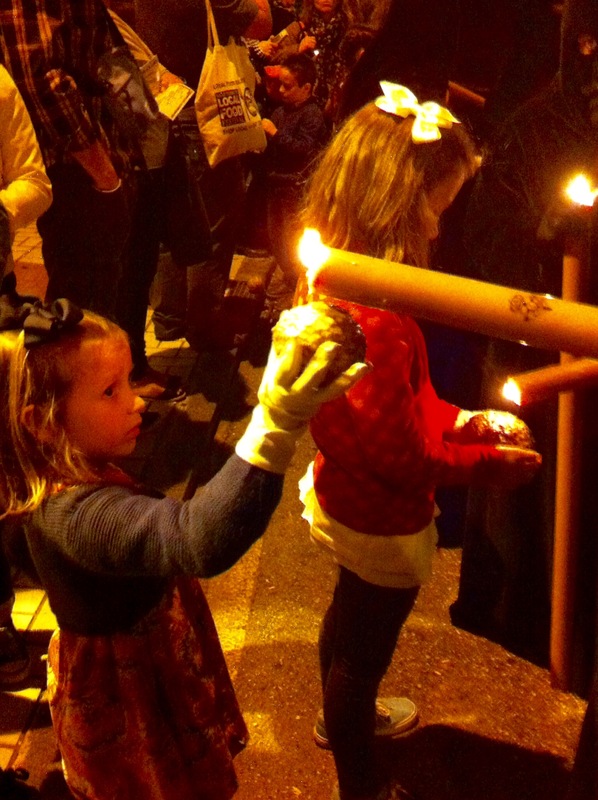 It also, in a way, is a kind of training for the children. A year or two later, many children learn to play a musical instrument, to emulate the youngsters they have admired in the bands marching with the tronos. 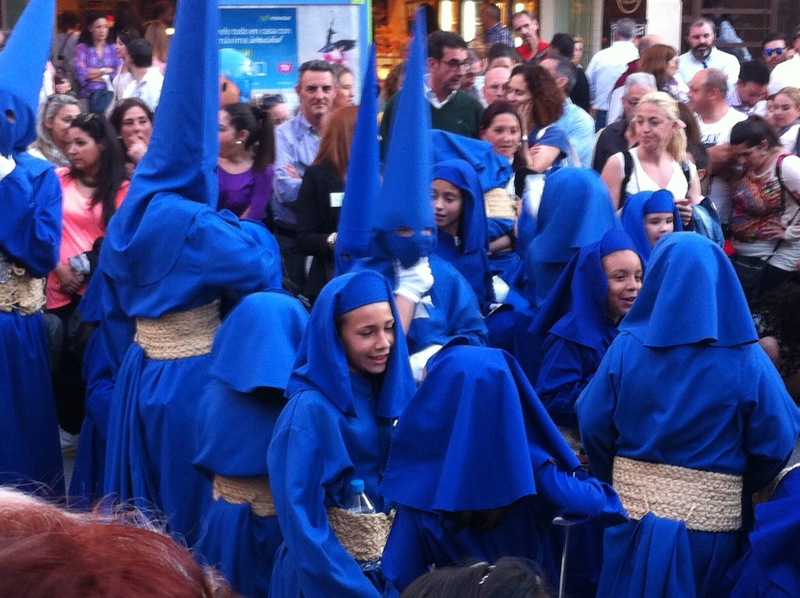 Even teenagers, who in England I cannot imagine clamouring to join in an event of this kind, here take enormous pride in their costume, the badge of their cofradía, their membership of a community which will sustain them throughout their lives as it did their fathers before them and as it will their children in years to come. It is a kind of training for finding your place and your path in the world. Taking part forms an element of socialisation and development, and perhaps getting to play trumpet and wear a smart uniform is a better option for a youngster than many of the alternatives. So apart from the parking, all-in-all even for this atheist, the whole palaver seems to come down slightly more heavily on the positive side. Though as the richly-decorated trono emerged from one cofradía, the local police politely but firmly moving aside the people queuing for an evening sandwich at the adjacent portakabins of Los Ángeles Málagueños de La Noche, I couldn’t help but wonder about the spending priorities of these only semi-religious (though fundamentally Christian) brotherhoods. 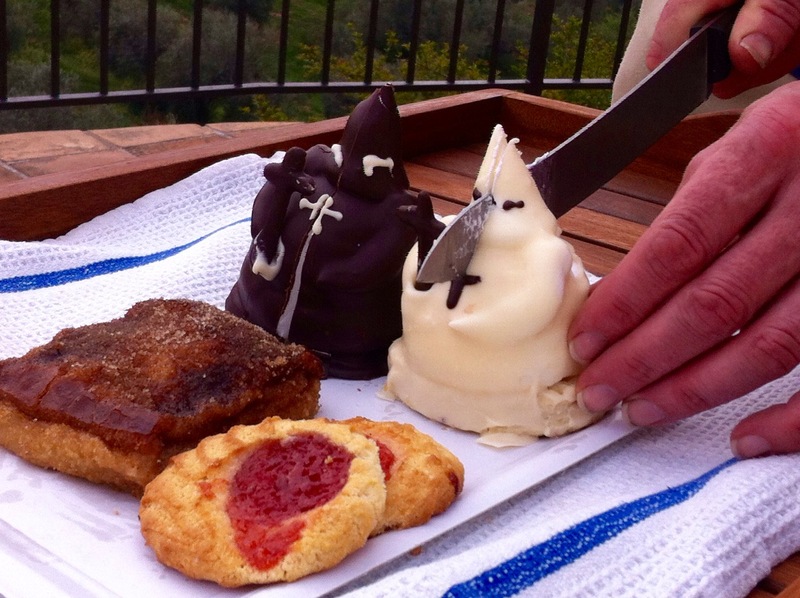 And at the end of the week, relaxing in the mountains with friends, we celebrated the end of this extraordinary, surprising, exciting but contradictory week, by decapitating a pair of chocolate-coated Nazarenos filled with that ghastly chalky white stuff that passes for cream in this otherwise delightful country. Our teacher at La Escuela Oficial de Idiomas, Fernando, has this way of curling his lip in a magnificent sneer when he refers to “Español para extranjeros” (Spanish for foreigners). He’s talking about the kind of sentences we construct that mark us out irrevocably as foreigners, even more than our permanently foreign accents. Sentences no Spaniard would ever say. “Did she like it?” “Maria liked the book”. You do sound like either a four-year old or a little bit simple, if you can’t shorten your sentences with the right pronouns! 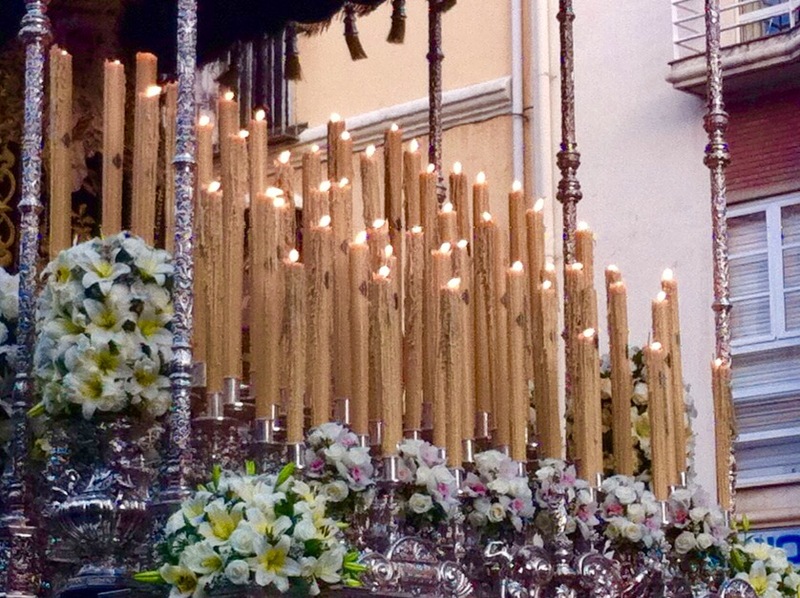 This entry was posted in Spain and tagged Andalucia, learning Spanish, Málaga, Semana Santa, Spain by tamaraessex. Bookmark the permalink. This post was fascinating and fun. Thank you.